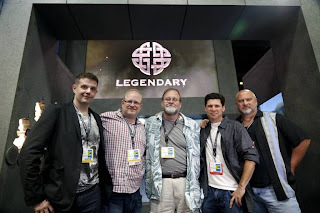 Legendary Comics (the comic book division of Legendary Entertainment) has brought industry vets Mark Waid, Shane Davis, and Max Brooks into the fold for a new graphic novel called Shadow Walk. The book, which was just announced, is heavy on Biblical flavor and is set to launch in 2013. Is the Shadow of Death a metaphor or could it be a real place? Three separate incidents – in 1914, 1948, and 1968 – in a valley near modern day Iraq seem to give credence to those who believe it is a real place. In each incident, all occurring during a time of war, a group of soldiers disappears and is never heard from again. Satellite photos over the Valley displays images that seem to defy the Second Law of Thermodynamics. Firsthand accounts and video – previously never before having seen the light of day - from all three incidents portray remarkably consistent tales of men being mutilated and god awful shrieking that could only be from a demon or monster. Now, two weeks ago, another photo taken over the area hints at some kind of new energy source. A small group of Special-Ops soldiers is sent into the Valley with two props – the skull of John the Baptist and a shard from the actual cross on which Jesus was crucified. Led by John Raines, an efficient killer with a strong code of ethics who has been rotting in Guantanamo for allegedly killing his entire platoon when he was dispatched into the Valley six months ago, they head into battle against a whole roster of creatures. Now they will find out once and for all if the road to Hell has just opened up.